Track and log system events. Is there a better alternative to Binocular? Is Binocular really the best app in System category? Will Binocular work good on macOS 10.13.4? Binocular is a customizable tool for automated monitoring and logging. It makes you able of tracking certain events that happen on your Mac and notifies you about them. 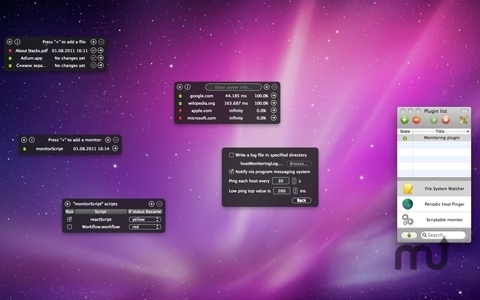 Binocular uses light semitransparent widgets to accomplish its tasks. They are placed on the desktop where they are always noticeable and easily accessible. Binocular needs a review. Be the first to review this app and get the discussion started! Binocular needs a rating. Be the first to rate this app and get the discussion started! Binocular is extensible. If it does not have means to solve your problem now, you can create your own solution, which doesn't require great programming skills. Then you can share it with others, so that they won't have to make effort. We will provide you with documentation for plugins API and advise on the development process. Download the plugin skeleton project. Customer feedback is appreciated: your ideas for new plugins may be implemented in future versions! With the default plugin your have 3 widgets which can ping hosts periodically, monitor changes to specified file system elements and run validation scripts which will check anything you make them to. Existing widgets not only notify you about happening events, but let you configure an automated response to them. Currently shell scripts and Automator workflows are supported. Fixed messaging window content dropping down a little when reseting the preferences.